A travel trailer is just as good as it’s hitch. Your vehicle not only needs to be able to tow the trailer, but it needs to be able to tow the trailer with all of your personal affects added! You’ll be driving over all different kinds of terrain, hills, puddles and potholes during the course of your family vacation. If you need help choosing a hitch for your travel trailer, you should feel free to contact our Service Department, and someone will help you make the best choice for your trailer and vehicle. We offer a variety of hitches, take a look below to see the differences between Equalizer hitches, Reese hitches, ProPride hitches and Hensley hitches. Click the tabs to learn more. Equal-i-zer® brand hitch works to help control trailer sway with 4-Point Sway Control®. Equal-i-zer®’s 4-Point Sway Control® is a combination of 4 positive friction areas that work together to combat trailer sway. 4-Point Sway Control® is superior to ®add-on® friction bars or cam-type systems that are used with conventional or chain-style weight distribution hitches. Innovative rigid trailer attachments serve two purposes. First, they work in conjunction with the rotational friction sway controls to reduce trailer sway. Second, the forward and back friction of the hitch arm on the bracket serves as a secondary sway control system. The sway control brackets work much like 2 ®add-on® sway bars, but with more sway stopping pressure and less hassle. The sway control brackets are the innovative link that makes the Equal-i-zer® hitch 4-Point Sway Control® system so effective. Our standard sway control brackets fit trailer frames up to 6 inches tall. Larger brackets for 8 and 10-inch trailer frames are also available. Rotational friction works to stop side to side sway before it starts. The rotational friction sway control is activated by downward pressure from the trailer tongue and upward pressure on the spring arms. The spring arms link the rotational sway control to the sway control brackets and distribute trailer tongue weight. The rigidity of the sway control brackets allows the dual rotational friction sway control to safely and effectively hold the trailer in line behind the tow vehicle and combat sway before it starts. Put them all together and you have 4 points of positive friction working for you. Take your towing to the next level with 4-Point Sway Control. The ProPride 3P hitch is the most advanced trailer sway control hitch available for your towing needs. Jim Hensley, the man who revolutionized hitch performance with his old design, has improved and enhanced his new design for your extraordinary towing experience. With easy installation and use you’ll experience towing stability and safety unmatched by any hitch available. 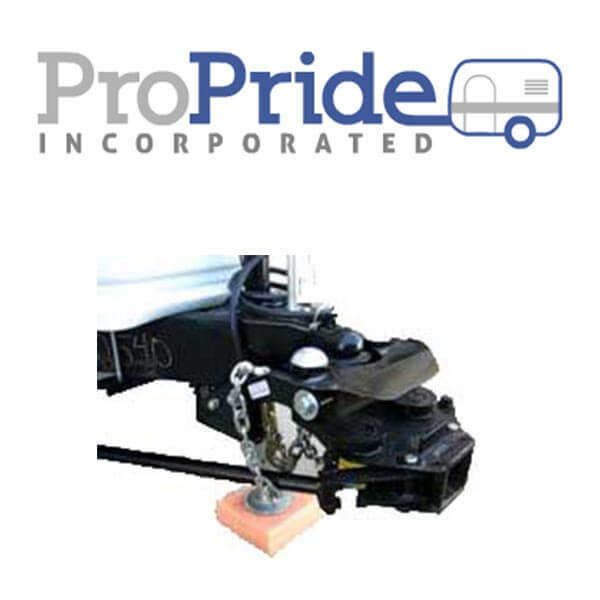 The ProPride 3P main unit consists of two 3/4″ thick links that project the pivot point of the trailer forward to near the rear axle of your tow vehicle. By not allowing the trailer to pivot side-to-side on the ball trailer sway is eliminated. The ProPride Yoke keeps the main unit hitch ball from pivoting in the trailer coupler which would allow the trailer to sway. Heavy duty weight distribution jacks allow you to distribute your tongue weight with precision and ease. The 3P adjustable hitch bar is designed for any tow vehicle and trailer combination now and in the future. It includes a bar tilt feature to compensate for hitch receivers that are not parallel to the ground. This tilt allows more efficient weight distribution for varying hitch receivers. The Strait-Line Hitch consists of our patented Dual Cam High-Performance Sway Control and our High-Performance Weigh Distributing System in one easy-to-install package. This is the ultimate hitch in detail and by design. No other hitch gives the driver the control this one does at a reasonable price. The Strait-Line Hitch was given this name as its pro-active design literally forces the trailer to stay in a straight line behind the tow vehicle. Evolving to meet the changing requirements of the towing market, our Weight Distributing Hitch Systems provide a softer ride and distribute load forces more evenly than ever before. The carrying capacity of these hitches is rated higher than others in the marketplace, allowing consumers to tow heavy loads with confidence. The Hensley Arrow can eliminate trailer sway. Why? The Arrow is the only trailer hitch on the market that doesn’t use friction to control sway. Every other sway control hitch uses friction in one form or another. The problem is that friction works both ways. While it dampens trailer sway, it also hinders the tow vehicle’s ability to turn or regain control of the trailer once trailer sway does occur. Eventually, enough side force (wind, trucks, uneven roads, etc.) will hit the side of your trailer to overcome the friction in your sway control hitch. At that point, the sway control hitch becomes a hindrance to regaining control of your trailer. Safety. The Arrow is the safest towing system on the road. Because of its patented linkage system, it is impossible to initiate trailer sway, the #1 cause of trailer accidents. The Hensley® Cub offers the same benefits as the Hensley Arrow®, but in a lighter package designed for the small trailer owner. Safe Towing: Towing with a Hensley® Towing System is even less stressful than driving without a trailer. With the Hensley® Towing System it is impossible for a trailer to sway. Even the most inexperienced driver will find towing easy, relaxed, and SAFE. Easy Hooking and Unhooking: Hensley® Towing Systems remain attached to you trailer at all times. No heavy lifting, no storage of greasy spring bars. Anyone can do it. Smaller Tow Vehicle: Feel locked out of RVing because of the cost of a tow vehicle and the fuel to go with it? With a Hensley® Towing System, you can tow your trailer with a small SUV, cross-over vehicle, or even a car. Don’t Get Stuck! Worried about getting wedged into a tight gas station or campsite? A Hensley® gives you more maneuverability and a tighter turn radius than any other hitch on the market. Do It Yourself Installation Hensley® Towing Systems are designed for quick, easy installation. No need for expensive, professional installation. The Last Hitch You’ll Ever Own: Hensley® Towing Systems come with a lifetime warranty on all parts and service. Better yet, your Hensley® is transferable to every trailer you’ll ever own. You’ll never spend another dime on your towing system. Fill out the form below and someone from our team will contact you shortly.